Cleaning up: Bill Hennessey of Qwatro RoyalPak. After pocketing $500,000 at age 25 from several ventures, including St. Party’s Day, the event-marketing brand he created and licensed, Bill Hennessey decided to buy “a sleepy brick-and-mortar business” in an industry that wasn’t crowded with other business-school grads. That way, the Toronto ’trep believed, he’d have less competition. In 2012 Hennessey began snatching up Canadian companies that manufacture industrial cleaning products, purchasing four for roughly $2.5 million in all and consolidating them into one uniform brand, Qwatro RoyalPak. He says most of the companies were stagnant, mismanaged or both. One was on the verge of bankruptcy. Another had no digital records to speak of—the previous owner maintained all data by hand. But all had one thing in common: a strong, loyal customer base. Now Hennessey has his eye on the U.S. market. He anticipates owning a U.S. industrial cleaning product company with $10 million in revenue by the end of 2016, and making $100 million in revenue by the end of the decade. Hennessey has taken an ambitious road to success. But not everyone has to spend millions or buy multiple companies to turn a tidy profit. One struggling business bought on the cheap can suffice. If you’re interested in rehabbing a fixer-upper, here’s how to assess the company’s viability, negotiate the deal and improve the bottom line. Check the legal standing of any business you consider buying. Liens against the company, pending litigation and outstanding payroll or income taxes are massive red flags. Reviewing the financials is another must. It’s not enough to scour the printed records, though. You have to pore over QuickBooks files and bank statements, says Casper, Wyo.-based serial entrepreneur KC Truby, who trains others to buy struggling companies. Another cue to ditch the deal: The employees are fleeing in droves. You don’t need everyone to stick around, but you do need at least a couple of solid team members to stay put, Truby says. You’re unlikely to land a bank or SBA loan to buy a floundering company. Seller financing—in which the seller lends you a percentage of the asking price—makes an attractive alternative. An owner whose business has been on the market for six to 12 months will be more likely to agree to these terms. Even so, sellers often want more than their company is worth. “The key is not the price that you pay, but the deal that you make,” says Truby, who’s a fan of agreeing to the asking price (within reason), but negotiating creative repayment terms. Cincinnati-area ’trep Mary Furrie used this approach when she bought Quality Assessments Mystery Shoppers (QAMS) in 2003. She agreed to pay the previous owner a quarterly bonus for a year as long as the business maintained or exceeded the revenue it had when she bought it. This gave the previous owner incentive to adequately train Furrie and help smooth the transition for clients and employees. Anthony Tremonto, owner of Studio ADT, a Tempe, Ariz.-based custom-framing business, took a different tack. When he and his wife bought the faltering frame shop in 2009, he negotiated the asking price down by 50 percent. But to appease the seller, he agreed to pass along 10 percent of any sales made to the previous owner’s customers for one year. “We thought that was a fair thing to do,” Tremonto says. 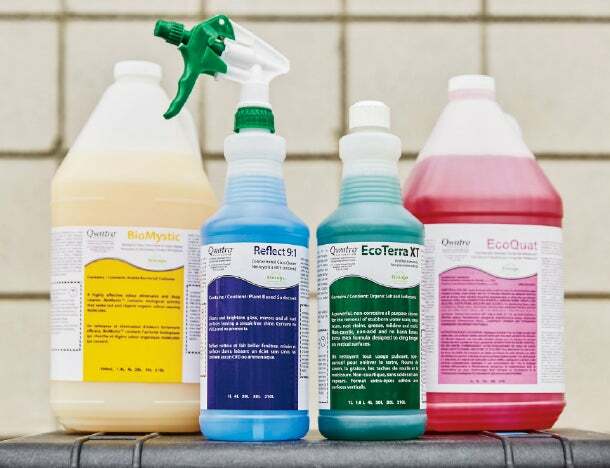 Seeing green: Qwatro’s sustainable cleaning products. One of the first things you should do upon assuming control of a company is to carefully review operating costs. Question any line-item expense from the last six months that doesn’t directly generate revenue. “Usually I find that somewhere between 30 and 50 percent of the operating costs cannot be directly associated with revenue,” Truby says. Appealing to your newly acquired customer base is essential. “The best way to do a turnaround is to go to your top 20 customers and say, ‘What are we doing that you like? What are we doing that you don’t care about? And who else are you doing business with?’” Truby says. Riley Harlan, a ’trep in the Minneapolis-St. Paul area, went this route in 2010 after buying Symtec Inc., which manufactures flexible heaters and controllers for power-sport vehicles. The previous owner had let sales and marketing efforts peter out, and the company was running on autopilot. Not surprisingly, revenue was dwindling. Determining how to better serve customers became a priority. “For me, that was a lot of time on the phone, a lot of time on the road,” Harlan says of his first six months running the company. After reengaging with customers, he increased revenue by 54 percent between 2011 and 2014, and anticipates another 15 to 20 percent jump this year. For Hennessey, proving to customers he’s serious about selling sustainable cleaning products is critical. To create Qwatro’s green chemical technology, he partnered with GreenCentre Canada, a lab that develops green chemistry products for the marketplace. To further boost credibility, he earned EcoLogo product certification from global safety science company UL. “Those partnerships have resonated really well in the customers’ eyes,” he says. Automating cumbersome processes is another obvious fix. Furrie will attest to that. When she bought QAMS more than a decade ago, the national mystery-shopping business relied on a menagerie of low-tech records and communication systems (think faxes and snail mail). “After getting the business, I automated everything,” she says. Sure, this required a $55,000 investment in new software and upgrades, but digitizing all her business data has vastly streamlined workflow and improved the company’s bottom line. “Overall, monthly operating expenses were cut in half,” Furrie says, and annual revenue has doubled. The best business deals aren’t always advertised. Here are four of the top ways to unearth a diamond in the rough. Business brokers operate a lot like real estate agents, only they help facilitate the sale of businesses. To find a business broker near you, contact the International Business Broker’s Association (ibba.org). Search “[Your region] business for sale.” If you specifically want a salon, restaurant or pet-sitting service, include those words in the search. Look for the companies with the highest sales volume that have been listed the longest, says serial entrepreneur KC Truby, who trains other ’treps to buy struggling companies. Go to the “for sale” section in your area, then scroll down to “business” and see what you find. “I scour Craigslist for keywords every day,” Truby says. Truby suggests telling accountants and attorneys in your target market that you’re on the prowl for a business to buy. Why? When a company is on the rocks, these advisors are often the first outsiders to know. Thinking about Buying a Business? Find a 'Favorable' Industry.